In 1987, the Boston Public Garden celebrated its 150th anniversary. Sculptor, Nancy Schon of Newton Ma, was commissioned by the Friends of the Garden to create the sculpture. Mrs. Mallard, and her eight ducklings (Jack, Kack, Lack, Mack, Nack Ouack, Pack and Quack) are large enough that children can proudly sit on them. The effect of being ridden by hundreds of children keeps the Mallard Family the City's best polished pieces of art. Make Way for Ducklings is a Boston story. You may recall that Mr. and Mrs. Mallard hatched their eggs on an island in the Charles River, and went in search of a better place to raise their ducklings. After visiting several areas of the city, Mrs. Mallard walked her children across Charles St., with the assistance of a police officer who stopped traffic for them. 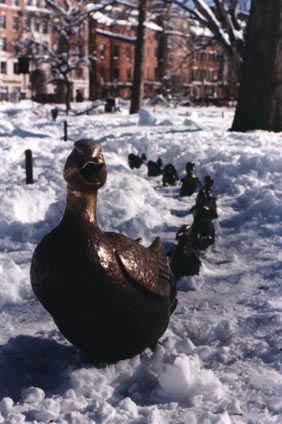 They arrived to their new home in the Public Garden, which is now commemorated with a childrens parade each spring.